In the late 1940s, teenagers explored a cave hidden in the flanks of jagged hills of Wadi Qumran in the Judean Desert. Inside, they discovered fragments of the original Dead Sea Scrolls—ancient collections of text that contain the oldest-known biblical manuscripts. Since then, archaeologists have found 11 Qumran caves that they have extensively excavated in search of the precious scrolls that date back more than 2,000 years ago. Now, a team of archaeologists from the Hebrew University of Jerusalem and Liberty University in Virginia have discovered what they believe to be a 12th cave on the cliffs west of Qumran. The Hebrew University press release writes that in the first wide-scale survey in the area since 1993, the team unearthed storage jars and lids from the Second Temple period (dating from 530 BC to 70 CE) in the cave that some scholars are already calling number 12. They also found a pair of iron pickaxe heads that they identified as being from the 1950s, suggesting the cave had been looted. Oren Gutfeld, an archaeologist at Hebrew University who was part of the dig, says he is confident that the newly discovered cave once contained Dead Sea Scrolls. 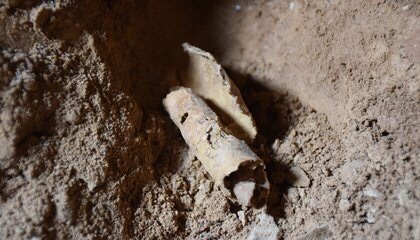 “Although at the end of the day no scroll was found, and instead we ‘only’ found a piece of parchment rolled up in a jug that was being processed for writing, the findings indicate beyond any doubt that the cave contained scrolls that were stolen,” he says in the release. In addition to Biblical text, the scrolls contain hymns, prayers, commentaries, and mystical formulas, Lawler writes. They’re so valuable that a fragment of an original scroll the size of a fingernail can cost up to $1,000,000, the Biblical Museum at Liberty University notes. The new discovery has Israel Hasson, director-general of the Israel Antiquities Authority, calling for more funding to systematically search all caves in the Judean Desert for artifacts that have yet to be discovered. “We are in a race against time as antiquities thieves steal heritage assets worldwide for financial gain,” he says in the release.